I don’t know why I try other banh mis – It seems at this point I could go to Vietnam, get one made by a master chef and still be like “eh, I think the one in Lowell is better.” That’s what happened today at Banh Mi Ngon, a small Vietnamese sandwich shop in West Roxbury. The shop was bright and clean, with a 4-seat counter and one table for two. 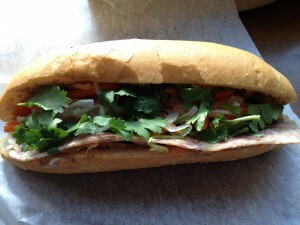 The menu has an array of banh mi options, as well as appetizers and pho. I went with #1 – the classic ($4.75). The sandwich lady was slower than molasses – a marked difference from my lightening fast lady in Lowell. I thought the sandwich was sloppy – the cucumber and carrots were cut too thick and I missed the pickled daikon that normally goes in the sandwich. The pate tasted like the canned deviled ham that Mama Tsoi used to get. The bread was heavier than Hong Cuc’s, as well. The sandwich was a disappointment on all fronts.